Your ultimate guide to overcoming losses and injuries and achieving greatness—on and off the field. Leading sports psychologist Jim Afremow, author of The Champion’s Mind, knows what makes good athletes great, especially when they come back to win after facing devastating injuries, tough obstacles, or seemingly insurmountable odds. Making a comeback isn’t just about raw talent or athletic ability—it’s the mental game that counts most. Jim Afremow, PhD, is a leading sports psychology consultant and licensed counselor. He is the founder of Good to Gold Medal, former sports psychology consultant at Arizona State University, and the author of The Champion’s Mind. He has worked closely with athletes at all levels, including pros from the MLB, NBA, WNBA, NFL, NHL, PGA Tour, and LPGA Tour. He lives in Phoenix, AZ. "At some point, and likely right NOW, all of us are in need of a comeback. But how do we get started? And where can we get help? The Champion's Comeback by Jim Afremow is your playbook. Using stories and strategies from the greats, Jim simplifies the steps to get started, adjust your mindset, form beliefs,overcome setbacks, and ultimately achieve your Champion's Comeback. Definitely a recommended read." "The power of positivity and theright mental approach is crucial in any sports field and in life in general. 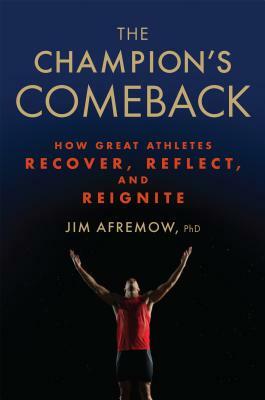 Dr. Afremow’s book The Champion’s Comeback can help lead you in the right direction."